So true. My husband and I just finished watching Paul Tripp’s DVD series “What Did You Expect?” (the book comes out end of April ;) One of the things that he said that goes right along with what you’ve written is that change is a process, not an event. Beautifully written – and absolutely the truth! This post was timed perfectly for me. About an hour ago I got home from a leadership class that I am taking at church. My husband stayed home from work today to work on outdoor projects to prepare our yard for a home renovation. I immediately became grumpy when I got home because of the dishes in the dishwasher and on the cabinet an went to work cleaning. What I should have done was be cheerful that they were clean and not dirty, waited until tomorrow to mess with them. 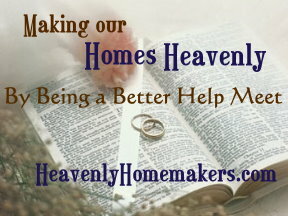 I should hav used my first moments home to praise my husband for hi hard work serving our family. Lesson learned. I really appreciate your blog! This morning in Ladie’s class, we discussed worldliness. One of the issues addressed was movies, magazines and novels (even Christian authors), and how we tend to forget that those relationships are not reality. It’s easy to expect such a relationship at home when we get too wrapped up in those false portrayals. Having said that, I have found an author and series that helped me recognize reality and to appreciate the little things that add up to a Godly husband and marriage. Lauraine Snelling has a series called, “The Red River Series”. It’s about a family that settles in North Dakota, having moved all the way from Norway. Wonderful story…but scripturally sound in the thoughts and conversations between a woman and her husband, between sisters about those around them…and so forth. p.s. i’m not a reader by nature, and I read 12 books in about 3 months time. I was so blessed by these books and know others will be too! Thank you so much for this wisdom! I’m getting married in two months, and I love finding advice that is both realistic and godly. I really appreciate you admonishing us to accept imperfections, be content in the Lord, and trust/rest in His ways instead of our seemingly sensible expectations. I made some homemade ice cream this past week! It didnt turn out as well as I hoped, because I have no ice cream machine, and wasnt able to break down the hard ice crystals enough to make it smooth and creamy….but I did not let it go to waste! Fortunately adding some milk to the ice cream and putting in the blender made tasty milkshakes! I think for now though, I will stick to buying ice cream at the store (even though I so rather make it at home)…I buy the Turkey Hill chocolate ice cream, only 3 ingredients and no bad stuff! Amen, Laura. I’ve been married for 12 1/2 years, and I absolutely, whole-heartedly agree. With everything. Thank you for the reminder!! I have a very dear friend who has a saying that sums up your article perfectly, “He’s not perfect, but he’s perfect for me.” Amen sister! Wise words and ones we need to remind ourselves of sometimes. Thanks for sharing this and giving me my reminder. I appreciate you writing this wonderful reminder. So true. Lot’s of wisdom and grace there. For me, once I let go of the expectations, which really were standards, of how everyone should be acting, joy came more naturally. I no longer believe I must be perfect wife/mother and I am actually far more productive. But my house is generally ALWAYS noisy and ALWAYS messy! Unless we know we’re having company lol! I think we can all enjoy each other more when we’re not measuring them against some list of expectations or standards, we’re then free to cheer each other on to be free and blossom into who they’ve been created by God to be. Nicely said, Laura! I also have to be very careful about my attitude after watching movies and reading books with “perfect” men in them! Wonderful post Laura! We hit 30 years this June! We have two girl variety and two boy variety. They have ALL been noisy. I’m kinda noisy too, so it’s all good. God bless and I continue to pray for your family and for the restaurant endeavor. laura, this post was so timely for me! i have been struggling so much this past school year with embracing the reality of the way things are. i don’t welcome change, which is mainly why i’ve struggled so much this past school year; it’s been a year of constant change. however, your post has helped me to see that i can CHOOSE to embrace this life God has given me with JOY. i so enjoy your blog and look forward to your posts and recipes!!! thank you for allowing the Lord to use you in such a neat way. I love all of my boys very much! But, I do have to admit that I hope to one day add a little girl to our clan too! Thank you so much for this post. It came just at the right time. I have been married almost 3 years and it definitely was not what I thought it would be like. I have these expectations for my husband and I think they are biblical expectations but I still need to learn to be content with the man that God gave me and basically lighten up. God knows me, He knows my heart and my needs and wants and desires. He loves me regardless. I have a great husband who is a great father and I did choose him! Thank you again for helping me to be content and choose joy! Thanks for a good and timely reminder. Thank you so much for the post. It is nice to know that just because I left the kitchen dirty does not mean I failed as a keeper at home. I too once had lofty, unrealistic expectations of my husband but God showed me how selfish I was being and now I try to keep such thoughts in check. I love this series by the way, its nice to read about women who actually honor and love their husbands! Would like to click the “LIKE” button! What a great post! If it makes you feel any better, I have three girls and they are far louder than their ONE brother! What a great post Laura! As always you have such a way with words, to make things speak straight to my heart but with humor sprinkled in! Thanks for sharing your wisdom, love and friendship with us! Laura, Thank you so very much for this timely reminder. My husband and I returned just last night from a 13 drive to visit with his daughter,son-in-law and our two grandchildren. I have real issues with their life style choices and after reading your article today, I realized that my frustration at my husband is really misplaced and needs to be re-directed to a more useful purpose. I realize that I DID marry the man I love and through time, we BOTH change and grow, just not necessarily at the same pace. I live the life that my husband promised me and for that I am grateful as all our children are grown with families of their own and most women at my stge in life would either want or have to work. I am truely Blessed that I am not in either of those situations…because of my husband. For this I am greatful and Blessed. Thank you for the timely reminder that thing may appear as if they are all messed up, but a gentle reminder to take a deep breath and take a fresh look at the situation will reveal that God has answered your prayers. Thank you so much for this post. I often have the tendency to live in a fantasy world with my view of how the “perfect” life is suppose to be. I will now look at my life with thankfulness and joy. Amen SISTER! …to so many comments you made. You know, as Christian women, we should fully understand that if we pray for and want to live out God’s will for our lives- then our OWN plans, dreams and goals are such an insignificant thing, really. I too, had a “vision” of what life would be like at 5, 10 and 15 years…and well, God had a different agenda. And I’m loving every minute of it. I have to be very careful when I’m reading a good Christian fiction book that I don’t suddenly become dissatisfied with my own husband and my own life. This is so important. I write Christian romances, and sometimes wonder if I even should, knowing I could potentially encourage someone’s dissatisfaction. Hey! I put a link to your site on my blog. I often find myself extremely disappointed because of my high expectations. It would be so much better for my sanity if I could try to keep my expectations realistic. Thanks for the reminder!